I’m not very happy with the iTerm plugin for Quicksilver. It does provide an action for opening Quicksilver’s current selection (i.e. 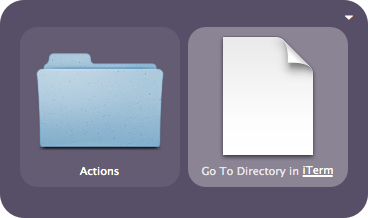 an alias to a directory) in iTerm, but it isn’t very fine tuned, actually. What it does is just open current selection into a new tab in the first opened iTerm window, which is an unwanted behavior in the 99.999999% of the occasions. The most handy behavior would be that the Quicksilver action opened current selection either in a new window (if there are no iTerm windows in your current Space) or in a new tab in the frontmost iTerm window of the current Space (if there are iTerm windows in your current Space). write text "cd '" & folder_path & "'"
set name to do shell script "basename '" & folder_path & "'"
The two previous AppleScript’s work perfectly outside of Quicksilver (e.g. when running them within AppleScript Editor). However, if you place these scripts in the Quikcsilver Actions’ directory and try to run them, they won’t work. To make them work, you must make some slight modifications (take a look at Quicksilver’s AppleScript documentation; my inspiration was the “Paste file path” action). For Quicksilver to recognize these actions, you must place both AppleScript files into ~/Library/Application Support/Quicksilver/Actions/ and restart Quicksilver. After doing that, you can just fire up Quicksilver, select an alias to a directory in the first tab, and then select the wanted action in the action tab (second tab).